Succulent Wall Planters add vibrant colors and breathing foliage to your boring garden walls, patios, yards, home walls can provide new freshness and attractive look to your space. Succulents can be the right choice to fill your indoor, outdoor or garden wall with their colorful and living art presence. Today, let’s have a short overview on succulents and the best picks of succulent wall planters . Succulents are plants that can be easily grown on earth, available in different size, color, and shapes. They can grow in any severe weather climatic changes and especially not a demanding plant. These feature of the succulent plant makes them special and unique for adapting to Vertical Gardening. Imagine your vertical garden, filled with colorful living plants along with the vibrant textures; this can provide instant interest in your garden or any space. Succulents are easy to create and care. Therefore vertical succulent wall planter can be the reliable pick to decorate your indoor or outdoor walls. How to Build a Succulent Vertical Wall Planter? Creating a succulent wall planter is not that difficult, you just need potting soil, frame, and succulent clippings for building a succulent wall planter. You can make the frame by yourself or get it from any home appliance store. If you are going to create a frame by yourself, then you need a wooden shadow box, picture frame, potting soil and planting fabric to make them. The first step is to add the potting soil to the planter; the wire needs to be accessible for the perfection and for securing the plants. First, with the help of those wires, you need to poke the ends and push it into the soil with your hand. Arrange the plants as per your need; now you need to make your frame dry for the plants to take root. This process will take about 5 to 11 weeks, once you find the plants take roots, they are ready to hang on your indoor, outdoor walls. How to make Your Display Eye catching? Succulents are available in different colors; you can choose the one that will suit your wall and cultivate it for the fascinating look. Know how you could arrange them to make it more attractive, you group multiple succulents so that they give a colorful look to your walls. Planting the same succulents completely also creates an attractive look. What about the Light Considerations? Succulents need lighting for them to thrive, so choose a wall that will receive at least seven hours of direct sunlight. Succulents can grow without sunlight too, but thriving will be considerably low when compared to the plants that grow in full sunlight. You need to water them when you find the succulent get dried; you can touch the soil with your finger to feel the soil. While watering, you need to remove the planter from the wall, water them and hang or fix it to the wall once they get the dry side. Once you are clear about the succulent plants, and how to use them to make your indoor or outdoor walls attractive, the next step is to know about the few brands offering succulent wall planters if you are going to get this wall planter any home appliance store or from online. To help you with, our professional team has collected few picks of succulent wall planters and listed out the top 5 picks below. Apart from the personal testing, the selected products are also based on the popularity, performance, customer ratings, reviews and considering much more specifications. The manufacturer is perfect in developing laborious and fascinating products to the garden; their products help your garden to look unique and to stay alive. Growing and planting can be simple with the help of their gardening system. So what is unique in this vertical succulent wall planter? Let’s check out below. Endless Indoor and Outdoor Possibilities: The Bloom Wall vertical succulent wall planters help you in delivering successful results, you have the option for mounting the planter to the wall both vertically and horizontally. Self Watering System: Succulents in general no need of much water, still the self-watering system helps in identifying about the watering necessity of plants. Perfect For both Indoor & Outdoor areas: You can provide the new life and vibrant look to any of the ugly looking or unused space in your yards, apartments, community gardens, patios, home, and schoolyards. 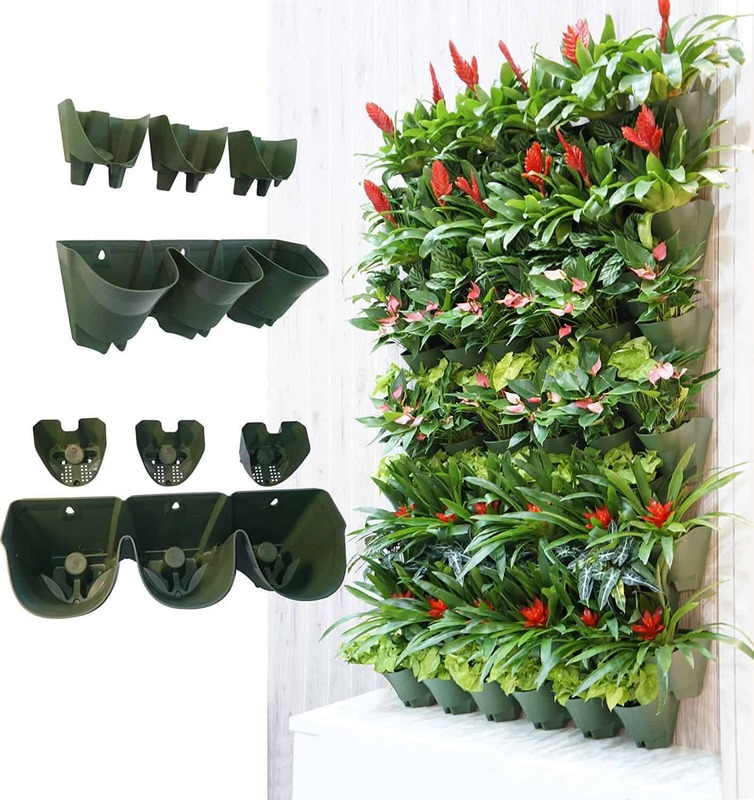 Products included: You can find four different pots, hanging bracket, one plant rank, and a manual to use the wall planter efficiently. Few Specifications: The succulent wall planter comes with the dimension of 22.4X7.1X7.1 inches and weighs about 5.3 pounds, the price of the product is high but worth the money invested for the product. It is possible to mounting the planter to the wall both vertically and horizontally. + includes 4 different pots. + for indoor and outdoor. It’s no wonder that the vertical living wall planter from Invigorated living ranks second in our best picks of succulent wall planters. This vertical succulent living wall planter is one of their flagship offerings that helps in decorating your indoor or outdoor area with ease. The product has many unique specifications when compared to other vertical wall planters, also preferred by most of the customers. So what makes them as a preferred choice, with over 95 of the positive reviews from the customers? Let’s find out. No more Boring Garden: This vertical wall planter helps you to add a number of succulents and provide the alluring and vibrant look to your indoor and outdoor space. Perfect for Indoor and Outdoor: This succulent vertical living wall planter comes with waterproof range and therefore the ideal solution to use it for any indoor or outdoor areas like the patio, balcony, home, small yards, large yards and much more spaces. 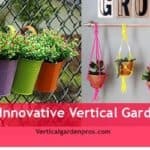 6 Pockets: The vertical wall planters indulge six pockets, and therefore you can grow six different succulents or ideal plants for providing the colorful and fascinating look to your garden. Option for Hanging: The design indulges the wall planter to hang, and therefore you can shift your wall planter anywhere with ease, helps you in providing the dream living wall at your spaces. Recycled Materials: The succulent wall planters are made of solid environment-friendly materials to reduce footprint. Other Specifications: The succulent living wall planter is available with the dimension of 20X0.4X28.8 inches and weighs just 1.4 pounds, the price is less when compared to previous products. It is made of solid environment-friendly materials to reduce footprint. A specialized manufacturer of gardening products, garden tools, machinery, watering equipment and garden decoration and are made with high quality and affordable price. 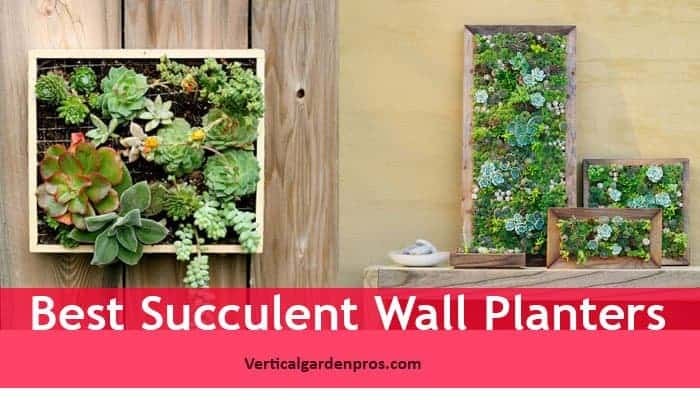 This ranks third in our best picks of best succulent vertical wall planters, here are some of the specifications that make the product unique and reliable. 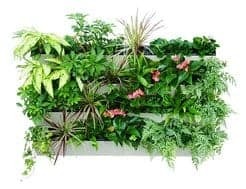 Perfect for any plants: This vertical wall planter not only allows succulents to grow, apart from that also supports tropicals, herbs, flowering annuals, houseplants, organic edibles, etc. to grow in their planters. 3 Pockets per Planter: The wall planter indulges three pockets in one planter and also consist of three filter layers for the water to get flow. Best to hang on fences, walls, etc. Self Watering: Watering is easier, the self-watering system detects the plants if they are in need of water and the amount of water is based on the climate and species of plants. Perfect for Indoor & Outdoor: As succulents can grow in any climatic changes, they can fit any indoor or outdoor space. The succulent wall planter can make your patios, railings, balcony, home and other area shine with the help of the colorful succulent plants. Drip Irrigation System: Based on Drip system and made of high-quality propene polymer and comes with a dimension of 19 inches in length, 7 inches in width and 6.7 inches in height, weighs just 1.6 lbs and considering the price, they are affordable. It also supports tropicals, herbs, flowering annuals, houseplants, organic edibles, etc. to grow in planter. + Less number of pockets. If you need your space to look simple and vibrant, then the right choice of wall planter would be from My Gift, these ceramic succulent planter pots are designed in providing the bright appearance to your indoor and outdoor area, this ranks fourth in our best picks of succulent wall planters. Modern & Elegant Look: The ceramic succulents pot provides the attractive, simple and stylish look to your indoor or outdoor space. 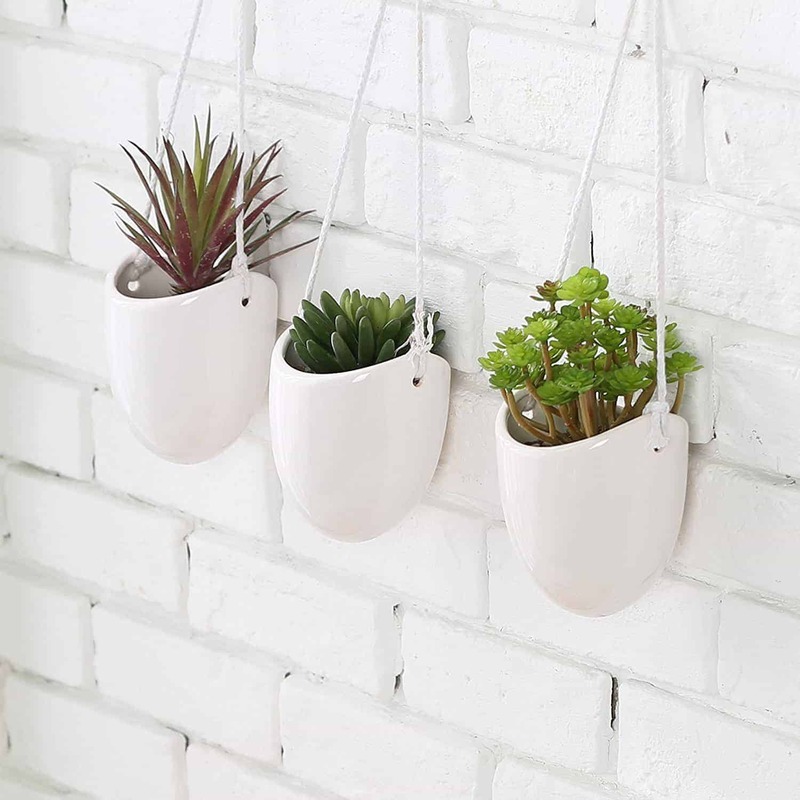 Easy Hanging: The white rope from the ceramic succulent plants to hang them to any fence, railing, etc. with ease. Simple Designed Pot: The pot that is made of ceramic designs in an easy way and this can adapt to any succulents such as cactus, herbs, etc. for providing the fresh and natural greenery to your space. Other Specifications: This ceramic succulent wall planter comes with the dimension of 4.25 inches in width, 12.5 inches in height and 3.75 inches in diameter and weighs just 1.8 pounds while considering the price they are considerably less when compared to other succulent wall planters. The pot that is made of ceramic designs in an easy way. + No choice of colors. The product has made with many specifications to make it ideal from other succulent wall planters; this ranks fifth in our best picks of succulent wall planters. Elegant Look: The real looking 3D artificial succulent wall planter includes succulents plants arranged with a mix of clusters for providing the modern and stylish look to your space. Easy Hanging: These succulents artificial decorated wall planters look similar to the floral art, and this is another unique creativity when compared to other succulent wall planters. Less maintenance: As plants grow in any climatic changes, you need not take much maintenance, they does not need more water too so that you can stay calm by just enjoying the decorative art in your home space. No mess and therefore attractive wall planter to adapt at your indoor and outdoor area. Handmade Flower Frames: The flower frames you get from the manufacturer is handmade, and therefore they last for years. The product comes with the dimension of 10.2X8.1X2.4 inches, weighs just 1.5 pounds, and the price is very less when compared to other succulent wall planters. These wall planters has a look similar to the floral art. In short, Succulent plants wall planters are an excellent idea to decorate your living space, patios, yards, garden walls with colorful succulent power stations. Hope you are clear about building a succulent wall planter of your own and best brands offering this wall planters for making your work easier. Any ideas and suggestions on the topics are welcome. Free free to share your questions and thoughts through the comment section below.